Its almost Halloween! The holiday where you have to buy treats for kids that aren’t even yours! Bonus though, you can eat the candy they don’t eat/can’t find the next day. Winning. Now come Halloween, I flinch looking through my news feed. Seeing all the amazing cakes from my uber talented friends, complete with custom goo, or realistic inside bites, just puts me off my twizzlers. I don’t do goo. So if you like your Halloween Cute and Creepy, I have some great ideas for your little Ghouls and Ghosts! Quick, easy, Reese’s, Oreo’s, Reece’s.. you see where I'm going with this. Adorably Batty bites from Chelsea’s Messy Apron. Taking the brush trend and putting some extra ‘OOOOHHHHOOO’ into it! Ghostly goodness from Erin Bakes. Also, check out Erin’s amazing book, filled with simple and clever cakes. Chocolate Swamp Monsters! Also known as Chocolate Spiders here in our house, although I LOVE the candy eyes! Adding that one next time! 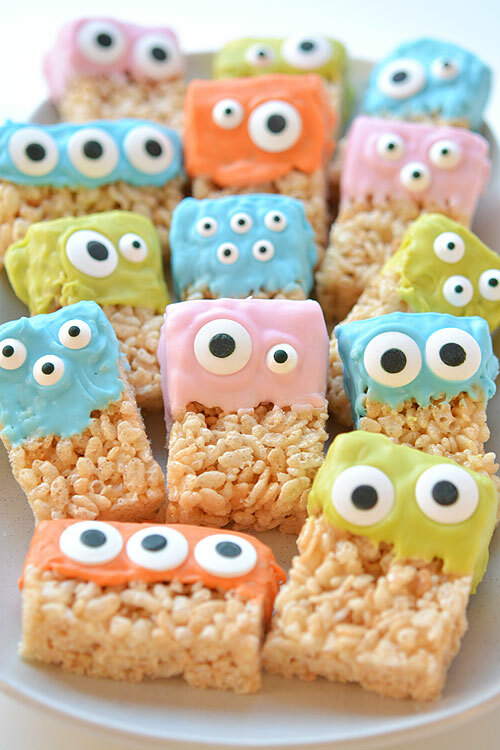 Crunchy munchy monsters, from Kidgredients. So simple, yet SO effective, and did I mention yummy? Clouds of sugary etherial goodness, from Wilton Cakes. This is one of the first Halloween Cakes I ever saw, and I’ve loved it from the start. So simple, but just so darn awesome! Here’s looking at you , Betty Crocker! Oreo’s. That’s all you need really. Cute, mildly creepy awesomeness from Bird On A Cake. Not everything Halloween has to be creepy! Embrace the season with this beautiful Pumpkin Spice Latte Cake from Liv for Cake. My little monkeys would have these gone before you can say Rice Crispy Tre… aw nuts. Simple and delicious, from One Little Project. A wicked spin on the Unicorn craze, this Witchy Unicorn will have you Defying Gravity! (That’s 2 puns, AND from a Musical.. #achievementunlocked). Its easy being green with the Cupcake Project. Its a cookie, with eyeballs. It has everything really. Ocular awesomeness from Lilluna. Have you got a favourite Halloween Treat? Be sure to share on my Facebook page!